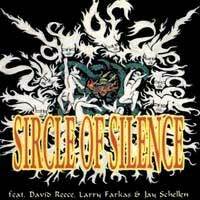 Upon the demise of Bangalore Choir, David Reece formed Sircle Of Silence with ex-Vengeance/Die Happy shredmaster Larry Farkas and ex-Hurricane drummer Jay Schellen. My initial interest in this band was that it featured one of my favorite guitarists, Larry Farkas, formerly of Vengeance Rising and Die Happy. However, David Reece, who was the American singer who sang on the one Accept album that didn't feature Udo is also a major part of this band. I found out about this band when discussing music with Larry Farkas on the phone. I didn¹t realize Larry had released anything since the breakup of Die Happy. After telling me about the Sircle of Silence CDs, he also informed me that it would be impossible to find a copy of the band's two albums as they were only released in Europe and Japan. 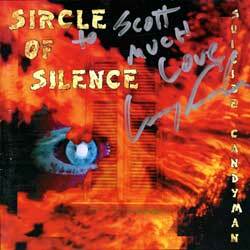 He even stated that he had to pay $30 for the one copy of the first Sircle of Silence CD he has. Ahhh, but having friends in high places helped and in no time I had a copy of both CDs in my hand. (Thanks Olaf!) Since I was singing in Larry's latest project (Once Dead, a reunion of the original Vengeance members) I presented these CDs to him at practice and had him sign them both. Upon receiving this disc, I was immediately drawn in. The music is heavy and captivating. From the opening riffs of "Color Blind" to the moody finish of "Slow Burn" I was smiling ear to ear. For some reason, I was expecting something a bit more pop-oriented like David's Bangalore Choir project. However, that was not the case either. Sircle of Silence's debut if far heavier. As a matter of fact, it's not until track five that the band even slows things down. Even this song isn't the typical radio-ready, sappy ballad, but rather a dynamic song that is melancholy during the verses, but picks up the intensity for the choruses. Those familiar with the first Die Happy CD might get an idea of what to expect, as there are some similarities in style. It's hard to explain, but this band successfully fuses together the heaviness of Larry's former bands with a commercial accessibility due to Reece's hooky lyrical hooks. As Larry Farkas is heavily influenced by the 1970's giants, the music has that same Deep Purple/Led Zeppelin flavor to it that Die Happy had. However, this is not some Zep-clone project like so many bands were doing in the 80's. Sircle of Silence is riff based metal with a ton of groove, thundering drums, extremely heavy guitar tones and screaming vocals. David Reece simply wails recalling the glory days of Ian Gillan! Simply put, I love this disc. It's a shame that such a fine metal platter never had the opportunity to be heard by the masses and was never given a proper U.S. release. When you get a new disc by a new band that you really enjoy, there is always that expectation for the next disc. Usually when it arrives you have burned yourself out on the first disc, and can get lost in the follow-up. As for me, I got both Sircle of Silence discs on the same day. I put on the first disc and absolutely loved it. I almost wished I had waited a month or two to hear this sophomore release so I would have had that same anticipation. Unfortunately I didn't and I can't say that I enjoyed this one quite as much on the first couple of listens. That is not to say that this isn't a good CD, because it is. As would be expected, Larry's guitar work is great and vocalist David Reece sounds fantastic. It's just that the songs weren't as immediately infectious. What I found, however, was that the more I listened, the more I enjoyed it. My favorite songs are the two lead off tracks, and two of the albums heavier songs; "Suicide Candyman" and "Gonna Die Laughing." Both have catchy choruses and crunchy guitar riffs. "There's Nobody Sacred" is a fast, heavy metal number with a smooth guitar solo through the bridge. "Someday Never Comes" carries a sweet 70's retro sound with a wah-wah guitar rhythm. "Sail Away" is a sweet, acoustic ballad that reminds me of something Badlands might have done and one of the few mellow moments on the disc. "Gift Horse Mouth" picks up the intensity again. "No Turnin' Back" starts off in what sound like it is going to be a ballad before slamming into yet another heavy rocker. This song has a lot of dynamics to it, from the clean guitar in the chorus to the heavy groove of the chorus. 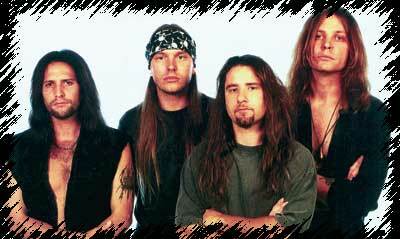 "Suicide Candyman" finishes off with with a fast and furious metal romp title "Drive the Nail". Complete with a ferocious double bass attack, this song finishes off a solid disc with a bang. So, while I still can't say I like "Suicide Candyman" quite as much as the debut, I can say that I do enjoy it quite a bit. This one certainly won't be a dust collector in my collection. My copy is autographed by guitarist Larry Farkas.